Our library is working on creating a up-to-date listing of our eBrary ebook collection, so we are reloading all of our eBrary links in the library’s online catalog, RaiderSearch. What is means for our users is that when searching in RaiderSearch for the next week or so, you may notice that some eBrary ebook links intermittently disappear and reappear. If you need to access eBrary this week, you may find it easier to go directly to GRCC’s eBrary webiste: http://0-site.ebrary.com.lib.grcc.edu/lib/grcc/home.action After this project is finished, all eBrary links will be back in RaiderSearch and this should eliminate any old links that no longer work. Please feel free to call (234-3868) or email (library@grcc.edu) the library if you have any questions about this process. Thank you for your patience and we look forward to providing a wide variety of eBooks for our students in the Fall semester! 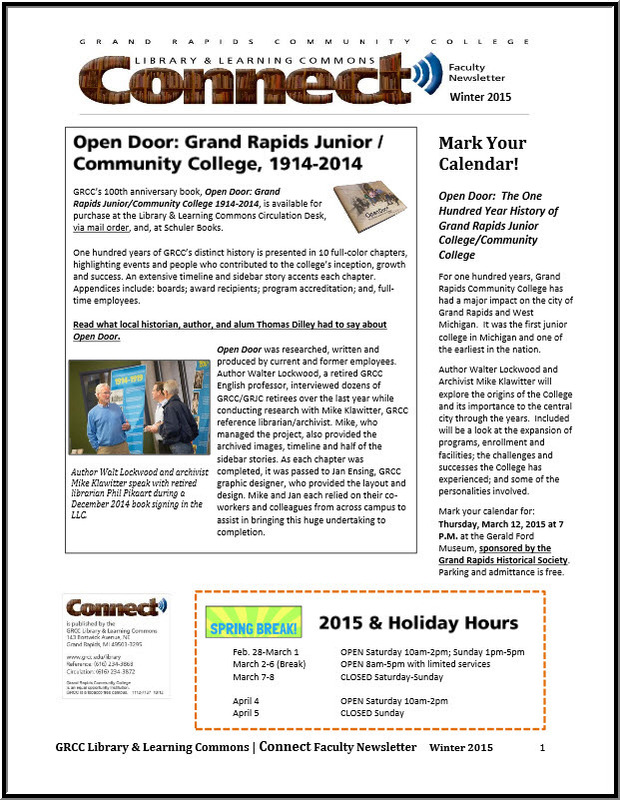 Please see the Winter 2015 issue of our CONNECT Faculty Newsletter. This issue includes information on: Open Door book & program activities; Spring Break and Holiday Hours; Exam Cram; Career Resources; Subject Guides; and more! To view the rest of the finalists & runner-ups, click here. GRCC Library has obtained a trial license for CRCnetBASES, a multidiscplinary database that spans over 40 categories, from agriculture to water science, and contains over 8,000 eBooks. The collections includes full text items such as textbooks and reference books from the CRC Press, and also includes online reference books from Auerbach and Chapman & Hall. If you’re interested in any of the content through CRCnetBASES, please contact Nan Schichtel and include which specific titles and/or subset collections would be useful in GRCC courses.